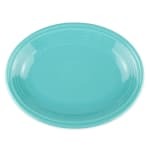 The Homer Laughlin 457107 Fiesta® platter is finished in vivid Turquoise, which makes it a great statement piece for any tabletop and enables you to pair it with other brightly colored Fiesta pieces. The depth and length of the platter make it functional for many different restaurant settings. This oval-shaped Homer Laughlin 457107 platter is durable and safe for use in the microwave and oven, and cleaning in the dishwasher.